Franz Biebl (1906 - 2001) made his way from choir director to professor of choral music to head of choral programs at Bavarian Radio. In this latter capacity, he often encouraged American choirs to visit Munich to perform on radio and with German choirs. A copy of the Ave Maria was given to the Cornell University Glee Club's director, who brought it back to the U.S., where it became ever more popular. A recording by Chanticleer made it a hit with the American public, which also brought it to much wider attention in Germany, where it had previously languished. 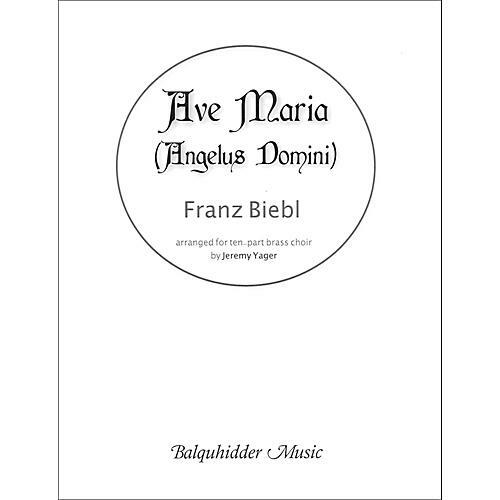 Originally written for male chorus, the Ave Maria is now available in several voicings by the composer, including a version for 7-part mixed chorus, and has been arranged for instrumental ensembles, as well. Now, Jeremy Yager provides a definitive brass choir version, faithful to the original, and suitable for high school and college ensembles.